You will quickly notice that things will be different than they were in Pre-AP Chemistry. For one, you must memorize a lot of the information that was given to you on the Chemistry Reference Tables. This assignment will help us gain an understanding of quantum theory (why atoms behave the way they do) and memorize that key information that you will need so that we can hit the ground running in August. A large part of AP Chemistry is constantly asking “why?” things happen. The structure of the course involves lots of examples together, textbook practice, labs that take multiple days to complete, quizzes, and exams. 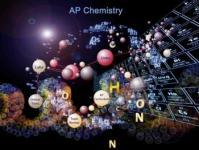 The AP Chemistry course is a 2nd year chemistry course that is designed to provide students with the equivalent of first year COLLEGE CHEMISTRY course. It is designed for college-bound students who either would like to earn college credit (by AP examination) or would like to prepare for college chemistry while in high school. This is accomplished through an intensive, in-depth approach. This course is structured around the six big ideas in the AP Chemistry curriculum framework provided by the College Board. It is highly recommended that the student take the College Board’s Advance Placement test in Chemistry, but the grade earned in the class is independent of the Advanced Placement test. Click here for an overview of the Big Ideas and Exam. Sign up for Remind to get text updates. The material in this course must be studied and learned daily as it is presented, because the units build upon one another. The College Board AP course description states that students should spend at least 5 hours a week studying outside of class. The actual amount of time spent will depend upon each student's background. If a student does not understand a concept, he or she should see me as soon as possible. AP should NEVER have zeroes!